by the Project Management Institute, with custom process and models developed by Mobilize.Net. Project Planning: The project formulation and analysis process, called a Ready Assessment, provides a detailed project plan with an accurate budget and schedule. Migration Team: It is important to have the right team to perform a successful migration. 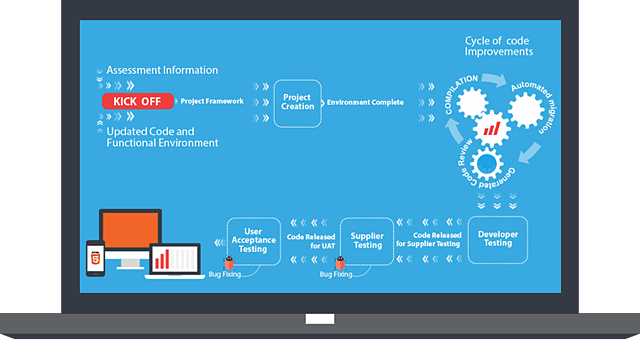 Project Life Cycle: There are some significant differences between a traditional software development project and a migration. Quality Assurance: The Migration Methodology outlines Quality Assurance activities and milestones to guarantee the project meets or exceeds the expectations of customers. Automatic Migration: The Visual Basic Upgrade Companion is key to the high productivity of migration projects, which can save as much as 80% of the cost of a rewrite. It is executed at this stage. Contact us today to learn how you can migrate your legacy apps to .NET, web, mobile and cloud for a fraction of the cost of rewriting them.